Guitar players are judged by many things: technical ability, flashiness, speed, the “touch”, or by the classic riffs or songs they’ve written or made famous. But, what really makes one guitar player better than another? And, why has Joe been so successful in the guitar instrumental genre, where most have had only marginal success? Very few guitar instrumentals ever made a dent on the radio. There were some exceptions over the years like Santana’s Europa and Samba Pa Ti, but in general, the radio and the masses prefer words and singing. In 1987, Joe’s second album, Surfing With the Alien , hit the airwaves and soon after become a big hit. The songs “Satch Boogie” and “Surfing with the Alien” were staples of the rock stations of the day, and his follow-up, “Always With Me, Always With You” became “THE” ballad of instrumental rock. So, what made these songs popular among the masses , while other guitar instrumentals never made it past a few guitarists’ car stereo decks? First of all, Satch Boogie had an infectious riff that had the mojo of some of Eddie Van Halen’s classic riffs. At that time, the guitar heroes were Eddie Van Halen, Steve Vai, Rhandy Rhoads, Kirk Hammett and a few others. So, this new guy came along that kind of sounded like Eddie and happened to be Steve Vai’s and Kirk Hammett’s guitar teacher. That irresistible combination certainly helped catapult him into instant Guitar Hero fame. But, that hype can only help someone get noticed. It can’t sustain a successful career. And, Joe is still going strong, year after year. Satriani had the ingredients and the right formula to become a huge star. But, his secret sauce was well-written songs infused with memorable hooks. Many of his songs have structure like pop songs: intro-verse-chorus-verse-chorus-solo/bridge-chorus. He often writes memorable melodies for his verses and choruses, then lets it rip for the solo/bridge section. Sometimes he throws in bursts of flash within the verse/chorus, but only if the song calls for it. Many instrumental guitarists have been unable to recreate this formula. They often overplay, assuming their technical skills will be enough to keep people engaged. But, they can’t put together a catchy melody that’s interesting enough to the non-guitar playing crowd. Writing a good “hook” is a hard thing to do. It needs to be unique and memorable, yet sound familiar. It needs to hit the ears like audio heroin, immediately addicting the listener. Joe has always had a knack for this. But a hook, whether in pop songs or instrumentals, needs to be somewhat simple, and creating something simple yet catchy is an elusive endeavor for most of us. A good hook needs to be melodic. It needs to sing. It needs to be interesting enough to grab the listener’s attention and haunt him for the rest of the day, forcing him to hum against his will. Joe has the chops and can unleash a fury of notes at will that will blow people’s minds and ears. But, he often chooses a simple melody as a motif for most verses and choruses. Then, when you say to yourself, “Ok, I can play that”, he rips something completely insane and you bow down like an unworthy servant. All of the great guitar players brought something new to guitar playing. Jimi Hendrix created sounds never heard before. Keith Richards used alternate tunings for many of his classic riffs. Eddie Van Halen exploded on the scene with mastery of tapping, pinches, dive bombs, and incredible phrasing. Yngwie fused classical music with metal. 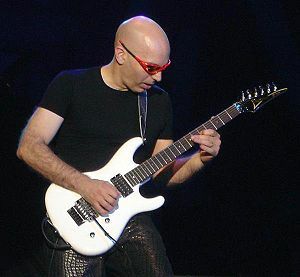 Joe Satriani obviously borrowed techniques from his predecessors, but he took them to the next level, making them his own. He tapped too, but sometimes with his pick instead of his fingers. He pinched and dive-bombed, but did it his own way. He used delay effects to create new and exciting sounds. He used octave generators and wah pedals in creative ways. All of these techniques, plus his phrasing, choice of notes and scales, have contributed to his “sound”. When you hear a Satriani song or solo, you know it’s him. But, I think his greatest differentiator was his songwriting. He fused many genres, some straight-forward and familiar while others quite exotic. His chord changes were definitely unique, and his use of non-traditional scales added some real interesting textures to his music. Before Satriani, most rock guitar players used blues and pentatonic scales, or the basic major and minor scales. Joe introduced many guitar players to new scales or modes, such as Lydian, Dorian and Phrygian. Scales that were typically reserved for jazz, experimental or some classical music, were brought to rock and it worked. Take a listen to one of his biggest songs, Flying in a Blue Dream. The first melody uses the Lydian mode, which has a sharp fourth. That one note adds a feeling of openness, like it’s building or climbing towards something. Satriani has done an excellent job of building a “Satriani” brand. But, what makes up his brand? Joe has had a few themes consistently woven into all his work over the years, as well as his visuals…space, the future and all things beyond this world. Take for instance some of the titles of his albums: Not of this Earth, Surfing with the Alien, Time Machine, Flying in a Blue Dream, Crystal Planet, Black Swans and Wormhole Wizards. All sound like titles of science fiction books. The same is true with some of his song titles. His music with the different scales and chord changes also fit this theme very well. They sound different, not like much of the music from today or from the past. To further establish this theme, he used his signature Ibanez JS model guitars over the years. These guitars definitely look futuristic. They have curves, no pickguards, and have usually come in various bright or stealth solid colors. And to really bring it home, Joe Satriani, himself has a look that’s very unique and recognizable. His head is shaved and he wears dark glasses, which kind of resembles the classic, buggy-eyed aliens we’ve come to know and love. In his earlier years, he had the long hair and tried to fit in with the 80’s style, but it didn’t seem natural, at least from what I remember. Once he shaved his head, he no longer had a visual association to the 80’s. Now, almost 30 years since the release of his first album, Joe Satriani shows no signs of slowing down. He is still touring the world as a solo artist and with his band, Chickenfoot, which he formed with Sammy Hagar, Michael Anthony and Chad Smith. He continues to release albums pretty regularly and lately has collaborated with some manufacturers such as VOX, to produce some great products for guitarists. On top of that, he still wins awards for his guitar playing. Satriani is probably the most successful guitar player in the instrumental rock genre. In fact, some say he invented the genre. He could have joined any band over the years, but chose to go at it alone. He did it his way. He worked hard, but more importantly, he worked smart. He wrote memorable songs and hooks, developed a unique style both musically and visually, and has become an icon among icons of rock guitarists, continuously building upon his extensive legacy. This blog post is among the few who I really feel come closest to describing Joe and his incredible career. – back to the first item, he truly is a NICE GUY; he has never said a negative thing about any of his peers in public and is honestly liked, respected and universally admire by musicians from all genres. Every single time I see Joe play, I always get the feeling that I am watching a true master at work, someone who not only has total command of his instrument but also is doing exactly the thing he loves the most in life. Joe Satriani really is the “best” and we are all so very lucky to have him around. Thanks for the comment and I’m glad you enjoyed the post. Although I have never met Joe, I got that sense about him from listening to some of his interviews and hearing the same things you mentioned from other folks. I’ve seen him in concert a few times, and once up close at NAMM. It’s awesome to hear that he is such a great and kind person in real life, but I expected he would be. Looking forward to his new album. This is a very well written and enjoyable article! I couldn’t agree more of the reasons for his success. Although Joe is as Technically gifted a player as anyone, as well as fast. His choice for musicality and composition supersedes these virtuosoistic traits. Joe can play anything and has an unbelievable understanding of music. It is this choice, that makes his songs enjoyable and the reason for his longstanding career as a solo artist. So many solo guitarist that grab and pull you in right away, but as quickly, the interest drops. Joe is one of the few solo guitarist that keeps your foot tapping and never gets boring.